NOTE: Before testing the sensor, check for HVAC DTCs (see page 21-101):. 1. Remove the outside air temperature sensor (seepage' 21-185). 2. Dip the sensor in ice water, and measure the resistance. Then pour warm water on the sensor, and check for a change in resistance. 3. Compare the resistance reading between terminals No. 1 and No. 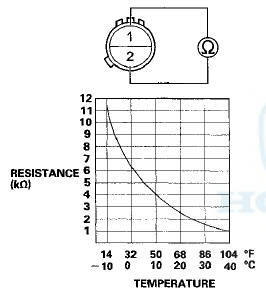 2 of the outside air temperature sensor with the specifications shown"in the graph; the resistance should be within the specifications. 4. If the resistance is not as specified, replace the outside air temperature sensor (see page 21-185).